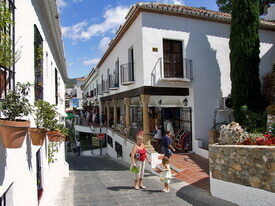 Mijas Pueblo is a typical Andaluz village of whitewashed buildings, with winding narrow streets, and the proverbial geranium strewn balconies, perched high on the mountainside with spectacular views to the Mediterranean below and a scenic backdrop of mountains and endless pine forests. On entering the village, it is possible to see the ancient spring, which provides natural mineral water. Stroll the narrow, cobbled streets and breathe in the atmosphere - stop for a coffee or a glass of wine along the way and sit and watch the world go by.. then take a trip around the village in the famous donkey-drawn taxis of Mijas. Visit the Hermitage of the Virgen de la Peña, which dates back to 1520. Built by Mercedarian monks, the inside of the hermitage is decorated with the image of the patron saint that gave this place its name. Legends tell that the Virgen de la Peña appeared right on this spot, in front of two shepherds which is why the heritage was built here and not elsewhere. Just below the heritage is a large and attractive botanical garden (plants are labelled with their names for information). The gardens are integrated with the old defensive walls of the town (la Muralla). There is also a rock gorge within the gardens, which makes an interesting rock climbing location for climbers to practice their skills, and lovely waterfalls and fish ponds. 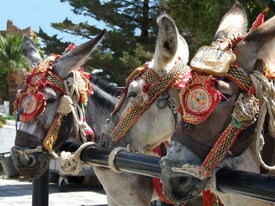 The Casa Museo is a fully restored museum displaying old farming tools and equipment. 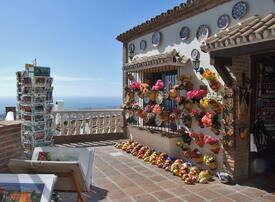 Located on the Plaza de la Libertad, the museum has a typical Andalusian style patio, and on the top floor a range of sculptures, paintings and traditional crafts can be viewed. 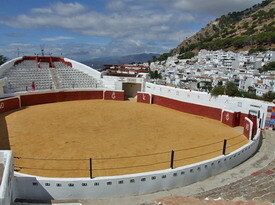 In the same area as La Muralla is the Plaza de Toros, or bull fighting ring. Built in the traditional manner in 1900 the bull ring though small offers exciting bullfights on a regular basis. The views from the seating area in the bull ring are astounding. Close by you can visit the Siete Caños square, the Casa de la Cultura and other other nearby points of interest. The Carromato de Max is a fascinating and special museum, located only a few metres from the main square and the town hall of Mijas Pueblo. It is a museum of miniatures which includes fascinating objects such as a picture of Abraham Lincoln painted on a pin-head or a prayer written on the borders of a visiting card. The entire Mijas area is a golfer's paradise with year-round sun and numerous championship golf courses within easy reach. Just inland from Mijas Costa you'll find La Cala North and South golf courses and the David Leadbetter Golf Academy. Also within easy driving distance are the famous courses of Valderrama, Torrequebrada, Alhaurin La Grande and Monte Mayor. About the Author: Anne Sewell is involved in web based accommodation reservations and advertising in Fuengirola, Spain. Visit All Madrid Accommodation.